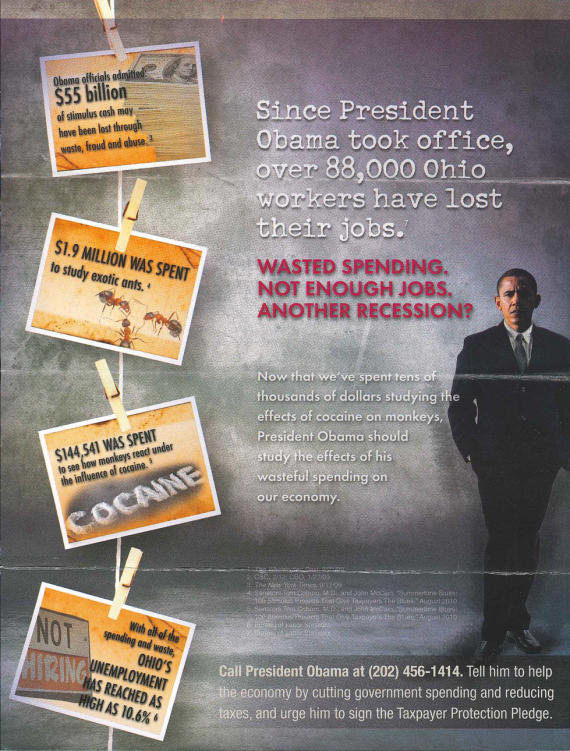 The mailer displays a 2012 newspaper headline, “Ohio second-worst for job losses.” But the article was about job losses over the last 10 years — a time period that saw Ohio lose hundreds of thousands of jobs. Under Obama, Ohio ranks higher than most states for job creation. ATR attributes job losses to Obama that occurred before he took office and cites figures from an employment survey that isn’t the standard measure for jobs. The flier claims Obama officials admitted that $55 billion in stimulus funds “may have been lost through fraud, waste and abuse.” Officials said no such thing. They were talking about trying to prevent such a loss. Our thanks to an Ohio resident who sent us ATR’s mailer, which she said she received last month. We’re including this piece on our Spin Detectors page, through which we ask our readers to help us monitor political claims and campaigns across the country. The Ohio reader asked us to withhold her name. The article wasn’t even about Obama or his time in office. The piece focused on Ohio’s poor national ranking for private-sector job growth from March 2002 to March 2012. George W. Bush was president for nearly seven of those years. And the time period includes a significant overall decline in the number of Ohio’s private-sector jobs, which peaked in June 2000. The truth is Ohio’s job growth under Obama ranks higher than most states. American City Business Journals, which includes the Dayton publication, used numbers from the Bureau of Labor Statistics to rank all 50 states and the District of Columbia based on private-sector job growth over 10 years. Ohio came in 50th (out of 51) — both for the number of jobs it lost (285,000) and for the percentage decrease (-6 percent). But under Obama, Ohio ranks fourth for the net number of private-sector jobs gained — nearly 200,000 – between February 2009, the president’s first full month in office, and July of this year. The state comes in 17th based on the percentage increase, which is 4.6 percent. Even accounting for the loss of more than 30,000 government jobs, Ohio still ranks 17th under Obama based on the total number of seasonally adjusted, non-farm jobs that it gained, which is 9,300. The state ranks 21st based on percentage change, which is less than 1 percent. Ohio also had a high ranking in a Rutgers University study that charted private-sector job gains in each state during and after the most recent recession. Ohio came in sixth for absolute jobs gained and 22nd based on the percentage at which it recovered jobs since December 2009, when the number of private-sector jobs bottomed out. Granted, Ohio still has more than 400,000 fewer private-sector jobs than it did at its peak of 4.9 million in June 2000. And it continues to be among the top states for government jobs losses under Obama, according to the Rutgers study and the National Conference of State Legislatures. And jobs numbers have plummeted in other states. For example, Florida lost 45,000 private-sector jobs between February 2009 and July. But Ohio is a far cry from being “the second-worst” for job losses under Obama as ATR claims. Plus, the country has experienced a net gain of more than 1 million private-sector jobs and more than 350,000 total non-farm jobs between February 2009 and July. ATR claims that “over 88,000 Ohio workers have lost their jobs” since Obama took office. But that number includes 25,000 jobs that disappeared before he took the oath. And ATR bases that job-loss figure on a BLS survey that economists typically do not use as the standard measure for jobs. As we’ve explained before, the Bureau of Labor Statistics produces its job figures from two major monthly surveys taken the week that contains the 12th day. Obama’s inauguration was Jan. 20, 2009. ATR bases its job-loss claim on numbers from the monthly Current Population Survey, which polls a sample of households, classifying people over the age of 16 as employed or unemployed. The survey showed that 5,440,551 Ohioans held jobs on Jan. 12, 2009, compared with 5,352,679 in July of this year — a difference of nearly 88,000. But if you count from February — Obama’s first full month in office — the difference falls to a little more than 62,000. Furthermore, Ohio has gained jobs under Obama based on the other major survey. The Current Employment Statistics survey is the standard measure for jobs used by economists and journalists. It collects information from businesses and government agencies and provides seasonally adjusted figures of employees on non-farm payrolls. The survey, which we referred to above, shows that Ohio has added 9,300 jobs since February 2009. The mailer also claims that “with all of the spending and waste, Ohio’s unemployment has reached as high as 10.6 percent.” The state’s unemployment rate was indeed 10.6 percent — above the national rate’s peak of 10 percent — for seven straight months between July 2009 and January 2010. But ATR fails to mention that Ohio’s unemployment rate has fallen well below the national average since then. It was 7.2 percent in July — almost 1 percentage point lower than the national rate of 8.1 percent. 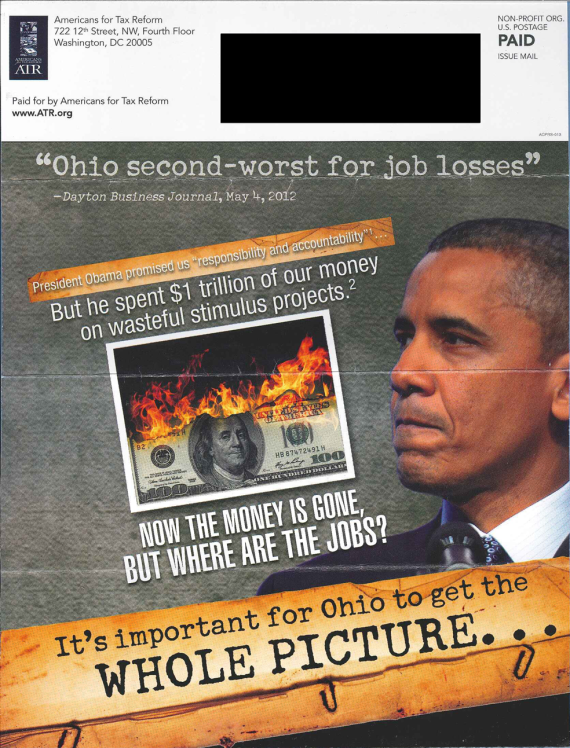 The mailer asks: “Now the [stimulus] money is gone. But where are the jobs?” As we’ve written before, the Congressional Budget Office has found that the 2009 stimulus positively affected the economy, making its strongest impact during the third quarter of 2010. Nationally, the unemployment rate was between 0.4 percentage points and 2 percentage points lower than it would have been without the stimulus, CBO said. The number of people employed was higher by between 700,000 and 3.6 million. The flyer also spins a quote from a 2009 New York Times article about the potential mishandling of stimulus money. ATR Mailer: Obama officials admitted: $55 billion of stimulus cash may have been lost through waste, fraud and abuse. Obama officials admitted to no such thing. Instead, they were talking about trying to prevent such a loss of American Recovery and Reinvestment Act funding. The $55 billion figure is based on the conventional estimate — often used by the Association of Fraud Examiners — that 7 percent of government spending is typically lost to fraud, waste and abuse. Seven percent of $787 billion — the cost estimate of the stimulus at the time — is $55 billion. New York Times, Sept. 19, 2009: To try to prevent that, the various federal inspector general offices, state comptrollers and auditors, and federal and local prosecutors have trained their sights on the stimulus money. The Recovery and Accountability Transparency Board, a nonpartisan watchdog created to prevent mismanagement of stimulus funds, said the government has lost a relatively small amount of money to fraud, as inspectors general have conducted more than 2,000 investigations. Certainly, there is anecdotal evidence of mismanaged stimulus dollars. One example could be the stimulus’s Weatherization Assistance Program, which provided money to the states to help low-income people make their homes more energy efficient. The Department of Energy found that West Virginia’s program suffered from nepotism, poor workmanship and billing errors. In Ohio, the state failed to inspect at least 5 percent of homes that were weatherized with program funds, a requirement of the grant. The federal government also used stimulus money to guarantee more than $500 million in loans to two green energy companies — Solyndra and Beacon Power — that later filed for bankruptcy.